Today in Germany, Princess Maria Theresia of Thurn and Taxis will marry Hugo Wilson, a British painter. The Thurn and Taxis princely family has a long history in Europe, but they gained global attention in the 1980s and 1990s thanks to the extravagant antics of Maria Theresia's parents, Prince Johannes and Princess Gloria. 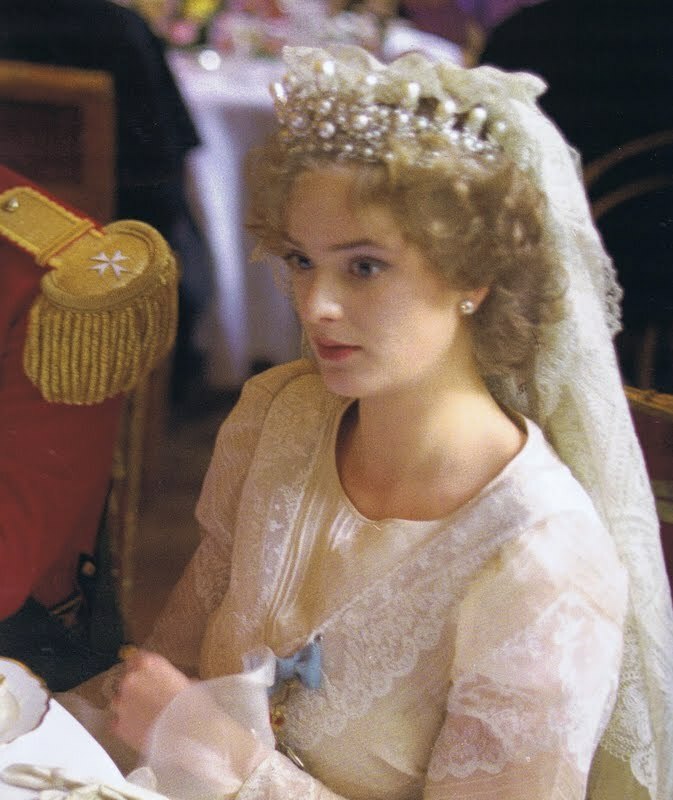 To celebrate today's princely wedding, let's have a look at the tiara worn at the last big TnT wedding: the pearl tiara of Empress Eugénie of France. This tiara, like so many others, was originally a wedding gift. It was given in 1853 to the last empress of France, the Spanish-born Eugénie de Montijo, by her husband, Emperor Napoleon III. The piece was a new one, made by Alexandre-Gabriel Lemonnier, but the jeweler had gems with pedigree at his disposal. 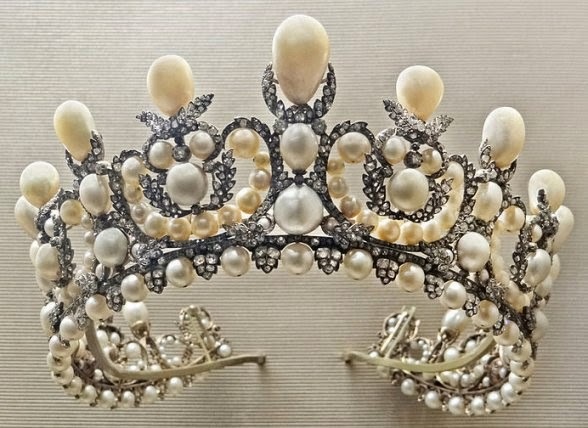 Stones that had once been worn by Empress Marie Louise (the second wife of Napoleon Bonaparte), and the Duchess of Angoulême (the daughter of Louis XVI and Marie Antoinette) were used to create the new tiara. All in all, there are more than two hundred pearls and nearly two thousand diamonds in this sparkler, which is made of silver. Eugénie wore the tiara extensively throughout her husband’s reign, including during a state visit to Windsor Castle in 1855. Winterhalter even painted her in it! But even though the tiara may have been a wedding gift, it was a part of the French crown jewels, just like the Duchess of Angoulême’s famous emerald tiara had been. 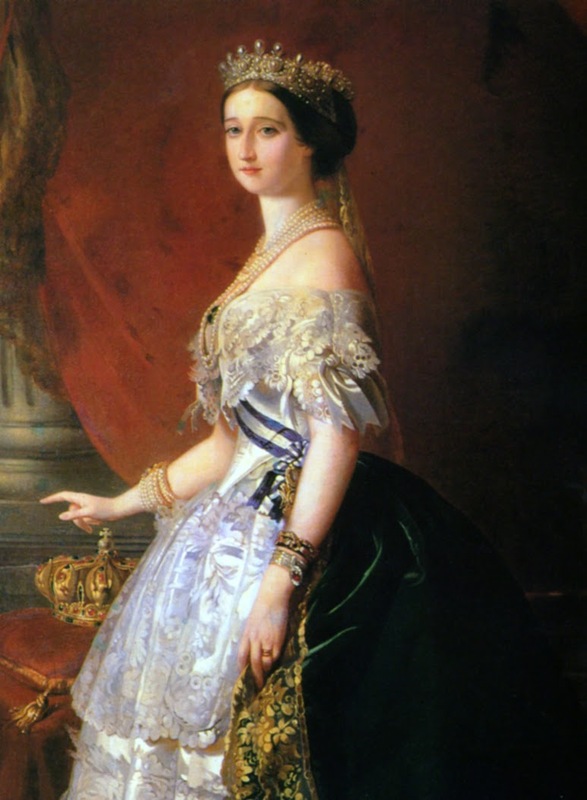 So when Napoleon and Eugénie were exiled to England in 1870, the tiara stayed in France. It followed the same path as its Angoulême cousin, going on display at the Paris World’s Fair and the Louvre Museum before being auctioned off by the government. But while the Angoulême tiara bounced around England for a century, this tiara ended up residing for a hundred years in another royal collection. 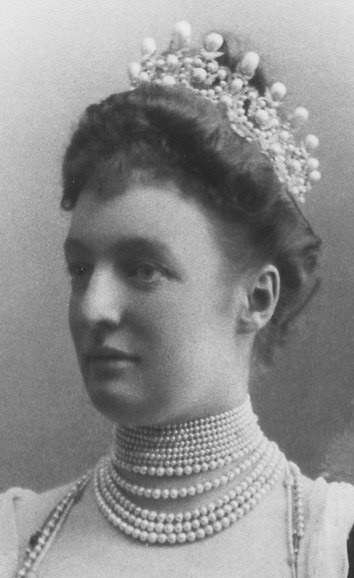 It was acquired by Prince Albert of Thurn and Taxis in 1890 as a wedding gift for his new bride, Archduchess Margarethe Klementina of Austria (pictured above). It stayed with the family for decades, and it was eventually worn by Princess Gloria at her wedding to Prince Johannes in 1980.